You can not go wrong with Pappadeaux, this is a wonderful Key Lime Pie. 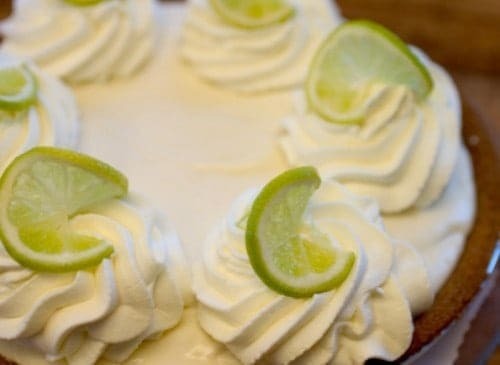 Pappeadeaux makes a fantastic key lime pie, you can make this pie at home. Beat cream cheese until light and fluffy add sweetened condensed milk, beat mixture until completely blended. Use a 2-quart saucepan to whisk egg yolks with water, add salt and flour. Stir constantly, completely mixing flour into liquid. Add lime zest, Roses Lime Juice and Key Lime juice. On low heat, or in a double boiler whisk the egg mixture and stir constantly until mixture thickens resembling pudding in texture and thickness. When egg and flour mixture is thickened add cream cheese. Whisk constantly taking care not to scorch the bottom of the pan. Stir until pie filling starts to thicken and is completely mixed. When the filling is thick pour into the prepared pie shell. Chill pie several hours before serving. Pie Crust Mix all together in a bowl, add melted butter blend well. Press into a buttered pie pan. Place in a preheated at 350 degrees oven for 7 - 10 minutes. When the crust is slightly golden remove from oven and cool. Raspberry Sauce Mix in a saucepan until preserves reach boiling point. Simmer for 4 minutes remove and pour through a fine strainer removing seeds and chill. Sauce may be used to garnish pie when served. The best key lime pie ever! Didn’t it used to have a macadamia crust? Can’t find in your recipe now. What can’t you find in the recipe? This pie is out of this world good! Don’t omit the raspberry sauce. It makes it so good!!! !